Objective: To explore the expression of apoptosis factor in rat models of steroid-induced femoral head necrosis. Methods: 90 SD rats were randomly divided into the control group and the model group. The rats in the model group were treated with 12.5 mg/kg prednisolone by intramuscular injection for twice a week to prepare the models of femoral head necrosis, while the control rats were injected with the same dose of saline with the same injection time as the model group. 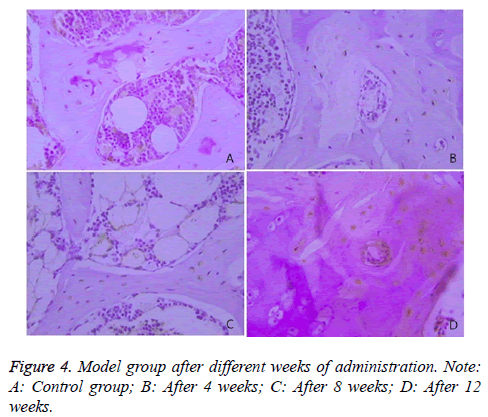 The rat femoral heads were obtained in 4, 8, and 12 weeks after injection, and then stained by haematoxylin eosin to observe the bone tissue morphology. The expression of Bcl-2 and Caspase-3 were determined by immune-histochemical staining and analysed for the correlation between the two ones. Results: Through microscopic observation, it is found that the model rats were successfully prepared. The expression of Caspase-3 protein in the model group was significantly higher than that in control group (P<0.05), and the longer the modelling time, the more obvious difference between the two groups; The expression of Bcl-2 in model group was significantly lower than that in control group (P<0.05); After Spearman rank correlation analysis, the expression levels of Bcl-2 and Caspase-3 were not correlated. Conclusion: Hormones can improve the expression of Caspase-3 to make the apoptosis of the femoral head, and reduce the anti-apoptotic effect of Bcl-2, so that lead to the necrosis. Femoral head necrosis is a common refractory disease in modern orthopedics. Its etiology is not very clear, which can be divided into traumatic and non-traumatic factors . One of the most common non-traumatic factors is the large number and long-term use of hormones, up to 46.5% . The mechanism of hormone-induced femoral head necrosis is unknown yet; most scholars believed that it is associated with hormone-induced metabolism disorders of rat local tissue. In recent reports, one research point out that large number of apoptotic cells were found in the femoral head tissue in vitro of rats with steroid-induced femoral head necrosis, suggesting apoptosis plays an important role in femoral head necrosis . Bcl-2 and Caspase-3 are important regulators of apoptosis in vivo, which may have a significant effect on steroid-induced femoral head necrosis . Therefore, the aim of this study was to investigate the expression of Bcl-2 (B-cell lymphoma-2) and Caspase-3 in rats with steroid-induced femoral head necrosis. 45 male and 45 female SD rats (5-month-old) weighting 200 ± 10 g were randomly divided into model group and control group. The rats were provided by Animal Experimental Center of our institute. Other materials and sources are shown in Table 1. This research was approved by the animal ethical committee of Zhongshan Hospital affiliated to Dalian Universiy. Bcl-2 immunohistochemistry kit Nanjing Jiancheng Biological Co. Ltd.
Caspase-3Colorimetric kit Nanjing Jiancheng Biological Co. Ltd.
Table 1: Statistical table of experimental materials and sources. Model preparation: Two groups of rats were fed 5 days to adapt the environment. After the adaptive fed, the rats were weighed. The rats in the model group were treated with prednisolone by intramuscular injection at a dose of 12.5 mg/kg twice a week (internal of three to four days), while the rats in the control group with the same dose of saline. During the construction of the model, rats were observed daily morning and evening, and provided with enough food and water. 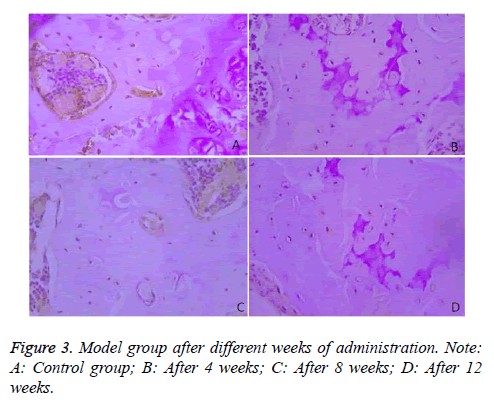 In 4, 8 and 12 weeks after treatment, 15 rats in the model group and the control group were sacrificed respectively for the femoral head specimen in vitro, which were fixed with formaldehyde solution and then sliced with paraffin for about 5 μm thickness. The above sections were dewaxed in xylene for three times, and each dewaxing time was between 2 min and 4 min. Following that, they were dehydrated in a gradient of ethanol, and rinsed with distilled water. The slice was stained with hematoxylin to slice for 3 min, and washed with distilled water till no blue dye, the stained with eosin for 40 s, then rinsed, at last the section will be closed with resin. The remaining paraffin sections were dewaxed in xylene, and then reacted in a 3% hydrogen peroxide-formaldehyde solution for about 15 minutes. After rinsing, it was incubated in 10 g/L pepsin solution for 20 min. 50 μl of calf serum was added drop wise into the incubated buffer and blocked for 30 minutes at room temperature. After air-dry, Bcl-2 and Caspase-3 polyclonal antibodies were added for incubation together at 4˚C overnight. In the next morning, wash with the buffer and drop bovine anti-goat IgG at room temperature for 1 h incubation, followed by the addition of streptavidin labeled with horseradish peroxidase at 37˚C for half an hour incubation, wash with the buffer, color develops with DAB, and then repeatedly rinse with tap water. Once re-dye completed, the section will be closed with resin. The pathological sections and immunohistochemical sections were observed by optical microscope (Leaci, Wetzlar, Germany). Three slices were selected at random. Each slice was divided into 10 fields, and each field was counted for 50 bone lacunas. The number of voids in the 50 bone lacunas was calculated for the proportion. Five high power fields were randomly selected on the immunohistochemical sections. The number of positive cells in 100 cells of each field of view was counted, and the mean values were obtained from five fields. All the data of this study was analysed with SPSS19.0 software. Continuous data expressed as mean ± Standard Deviation (SD) and quartile (Median (P25-P75)). ANOVA with Bonferroni test was used to analyse the differences between two groups with multiple time points wherever applicable. The test standard a=0.05 was considered statistically significant when P<0.05. There were no significant differences between the rats in control group at 4, 8 and 12 weeks of the experiment process. The subchondral bone was thick and continuous, the capillary network was abundant, the trabecular bone of the femoral head was bulky, the morphology of osteocyte of bone lacuna was generally normal with rare fat particles, and hematopoietic cells were rich (Figure 1). Figure 1: The slices of rats in the control group. As shown in Figure 2, in the model group, after 4 weeks of administration, the subchondral bone was thick and continuous. The trabecular bone was bulk, the adipocytes and red cells were abundant, and the rate of the empty lacuna was lower. After 8 weeks of administration, the subchondral bone was thinner than that in the 4th week, and in interruption of continuity. However, the adipocytes in the emptiness of the bone lacuna were increased, and the rate of the empty lacuna was higher than that in the 4th week. After 8 weeks of administration, the subchondral bone was thinner than that in the 4th week, and in interruption of continuity. However, the adipocytes in the emptiness of the bone lacuna were increased, and the rate of the empty lacuna was higher than that in the 4th week. Figure 2: Rats in the model group after different weeks of administration. NOTE: A: 4 weeks; B: 8 weeks; C: 12 weeks. The comparison of the rates of the empty lacunain the control group and the model group at different administration time was shown in Table 2. Table 2: The comparison of the rates of the empty lacuna between the two groups. Immunohistochemical results demonstrated that Bcl-2 was mainly expressed in the cytoplasm of the bone cells, and was in brown color. The rates of Bcl-2 positive cells in the two groups were compared in Table 3 and Figure 3. Figure 3: Model group after different weeks of administration. Note: A: Control group; B: After 4 weeks; C: After 8 weeks; D: After 12 weeks. Table 3: The comparison of the rates of Bcl-2 positive cells between the two groups. The expression of Caspase-3 in the two groups was illustrated, and the comparison of the rates of Caspase-3 positive cells between the two groups was presented in Table 4 and Figure 4. Figure 4: Model group after different weeks of administration. Note: A: Control group; B: After 4 weeks; C: After 8 weeks; D: After 12 weeks. Table 4: The comparison of the rates of Caspase-3 positive cells between the two groups. The Spearman rank correlation analysis indicated that expression of Bcl-2 and Caspase-3 had no significant relationship (P>0.05). The osteonecrosis of femoral head, referred to as femoral head necrosis, which is caused by blood circulation disorders on account of a variety of pathological factors, eventually leads to necrosis of bone cells, bone marrow hematopoietic cells and other functional cell . The specific pathogenesis of the femoral head has not yet a unified understanding, mainly including the following aspects: bone cell damage theory; lipid metabolism disorders theory; osteoporosis theory; intravascular coagulation theory . In recent years, with the development of clinical medicine and basic medicine, femoral head necrosis is closely related to cell apoptosis. Apoptosis is part of the aging or dysfunctional cell autologous death regulated by gene internal control program to maintain the stability of the internal environment, which is significantly different with cell necrosis, because it is mainly a self-protection mechanism of the body . In the 1950s, some foreign scholars found that the excessive use of glucocorticoid can lead to the femoral head necrosis. After 20 years, the clinician reported a large number of patients taking glucocorticoid developed femoral head necrosis, and the follow-up study showed a lot of apoptotic cells were in the necrosis site of the femoral head . In the progress of femoral head necrosis modeling, Weinstein et al. revealed that a large number of apoptotic bone cells and osteoblasts were present in the specimen of steroid-type femoral head necrosis, while significant fewer in traumatic and alcoholic femoral head necrosis . Caspase-3, also known as cysteine protease, is a member of the family of IL-1β-converting enzyme, which is considered as an important regulator of apoptosis. Caspase-3 is involved in cascade amplification reaction with other caspases, and regulated by Caspase-1, 2, 10, Caspase-3 kinase and other enzymes and proteins. The activated caspase-3 can regulate the expression of DNA-dependent endonucleases to affect DNA replication, transcription and damage repair. It plays main role in leading to cell apoptosis, so its expression was generally high in the apoptotic tissue [10,11]. In this study, the expression of Caspase-3 in specimen of the necrotic femoral head in the control group was significantly lower than that in the control group (P<0.05). At the same time, the expression of Caspase-3 in different time (4, 8 and 12 weeks) in steroid-induced femoral head necrosis group has significantly difference. The longer the administration time, the more severe the femoral head necrosis, which was consistent with the histological sections of the rats. Bcl-2 is an early apoptosis-related factor, which can protect the mitochondrial membrane, and prevent p53-mediated apoptosis pathway by binding to calmodulin phosphatase, p53 binding protein and other enzymes and proteins, so Bcl-2 is an anti-apoptotic factor and selected as the indicator in this study . The results indicated that Bcl-2 in the control group was significantly higher than that of the hormone model group in the same time period. And Bcl-2 of the control group at different time have no significant difference, while the expression of Bcl-2 was significantly decreased with the prolongation of administration time in hormone model group is the hormone model structure. There was no significant correlation between the expression of Caspase-3 and Bcl-2 (P>0.05), suggesting there was no direct relationship between the expression of Caspase-3 and Bcl-2. In summary, the hormone can increase the expression of Caspase-3 to promote the apoptosis of femoral head cell, and reduce the anti-apoptotic effect of Bcl-2, so that lead to the femoral head necrosis. Bcl-2: B-cell lymphoma-2; SD: Sprague Dawley. Chan KL, Mok CC. Glucocorticoid-induced avascular bone necrosis: diagnosis and management. Open Orthop J 2012; 6: 449-457. Gomes CC, Bernardes VF, Diniz MG, De Marco L, Gomez RS. Anti-apoptotic gene transcription signature of salivary gland neoplasms. BMC Cancer 2012; 12: 61. Silverman SL, Maricic M. Recent developments in bisphosphonate therapy. Semin Arthritis Rheum 2007; 37: 1-12. Plotkin LI, Lezcano V, Thostenson J, Weinstein RS, Manolagas SC. Connexin 43 is required for the anti-apoptotic effect of bisphosphonates on osteocytes and osteoblasts in vivo. J Bone Miner Res 2008; 23: 1712-1721. Conradie MM, de Wet H, Kotze DD, Burrin JM, Hough FS. Vanadate prevents glucocorticoid-induced apoptosis of osteoblasts in vitro and osteocytes in vivo. J Endocrinol 2007; 195: 229-240. Kitajima M, Shigematsu M, Ogawa K, Sugihara H, Hotokebuchi T. Effects of glucocorticoid on adipocyte size in human bone marrow. Med Mol Morphol 2007; 40: 150-156. Vegran F, Boidot R, Solary E, Lizard-Nacol S. A short caspase-3 isoform inhibits chemotherapy-induced apoptosis by blocking apoptosome assembly. PLoS One 2011; 6: e29058. Fransen JH, Dieker JW, Hilbrands LB, Berden JH, van der Vlag J. Synchronized turbo apoptosis induced by cold-shock. Apoptosis 2011; 16: 86-93. Weinstein RS. Glucocorticoid-induced osteoporosis and osteonecrosis. Endocrinol Metab Clin North Am 2012; 41: 595-611. Zaidi M, Sun L, Robinson LJ, Tourkova IL, Liu L. ACTH protects against glucocorticoid-induced osteonecrosis of bone. Proc Natl Acad Sci USA 2010; 107: 8782-8787. Wang JZ, Gao HY, Wang KZ, Zhou RX, Li XD. Effect of Epimedium extract on osteoprotegerin and RANKL mRNA expressions in glucocorticoid-induced femoral head necrosis in rats. Nan Fang Yi Ke Da Xue Xue Bao 2011; 31: 1714-1717. Kerachian MA, Harvey EJ, Cournoyer D, Chow TY, Nahal A. 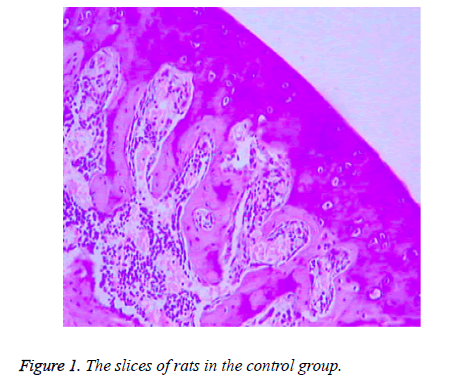 A rat model of early stage osteonecrosis induced by glucocorticoids. J Orthop Surg Res 2011; 6: 62.